Rest in peace Michael Jackson! One of the major casualty of the Michael Jackson sudden death is his planned comeback concert, This Is It, the first major series of concerts since the HIStory World Tour finished in 1997. 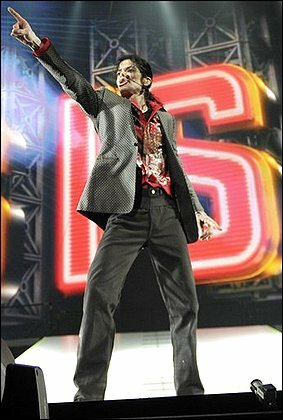 This Is It scheduled to start on July 3, 2009 at the O2 Arena, London, and already sold out all 50 concert performances tickets, which numbered at over 1 millions. AEG Live, the promoter of the Micheal Jackson’s This Is It concert, has released exclusive video footage via CNN of Michael Jackson rehearsing a remix of They Don’t Care About Us with eight male dancers for the upcoming concert at the Staples Center in Los Angeles on June 23rd, 2009, just two days before he died. The “They Don’t Care About Us” remixed included excerpts from History and In The Closet, similar to how the song was performed during Jakcson’s History Tour. “They Don’t Care About Us” is a hip-hop song from Micheal Jackson’s HIStory album. Watch the original broadcast of CNN announcing the exclusive Michael Jackson rehearsal video footage. The Staples Center, 20,000-seat Los Angeles arena will also be used as the site of Jackson’s memorial service, which is scheduled to begin 10 AM on Tuesday, July 7, 2009. Besides, good news is that whole Micheal Jackson’s final dress rehearsal was recorded by AEG Live in multi-camera high-definition video and multi-track surround-sound audio, and might be released as a ‘live’ album, DVD or pay-per-view VOD.